Have you ever bought a notebook just because it looked pretty and you didn’t actually end up using it? Today I thought I would put together 12 ways to fill and make use out of your notebooks because let’s be honest at least once we’ve all been there with a never-ending amount of blank notebooks that we definitely need to put to good use. If you’re a blogger like me or just genuinely love setting goals, then a goals notebook could be the one for you! Use your goals notebook as a place for you to come up with and put together some goal ideas you wish to work on. Whether they’re for your academical, work or personal life, then a goals notebook can be a great way for you to record and keep track of your progress as you work through your goals. It’s also a good way to reflect on your growth and how you can improve as you move through the process. I love having a specific place to keep track of my goals so a blank notebook dedicated just to that can be great for keeping you accountable and motivated. The one way I keep my blog consistent and efficiently running is by staying organised. 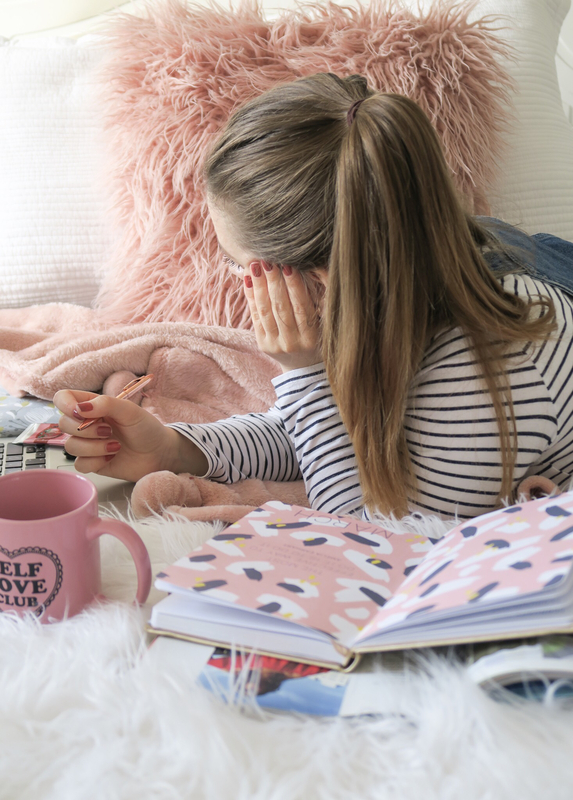 Having a notebook dedicated to all things blogging is a great way to ensure you’re getting the most out of your blog and its process. You can keep track of goals, collaborations, to-do lists, emails, blog post ideas, checklists for your blog posts, brainstorm ideas, work on your branding, draft posts, keep note of important details and much more! Plus you can still use your notebooks for pretty flatlays so it’s a win-win! Who doesn’t love putting together a to-do list? Having a notebook with all your to-do list’s inside can be a great way to keep things not only organised but also the extra boost of motivation you might be after. Writing out a to-do list for the day or the week ahead always keeps me going. It gives me a clear sense of focus and what I need to be doing regarding tasks. Plus isn’t it just so satisfying ticking something off? Something I really want to practice more of is gratitude. A gratitude journal can be the perfect place to start as it’s one space dedicated to practising daily gratitude and a good way to reflect back on your more grateful moment’s overtime. It can be a great pick me up especially on harder days when you need reminding of all the good! The most common practice is to start each morning by writing three things a day you’re grateful for. Or you could even do this at night before you go to bed, picking out three things from that day that you’re grateful for. When I think of a food diary I think of a chart I used to keep at primary school when I did the SPEEDY study which focused on sport, physical activity and eating behaviour of children. Of course, we’re no longer children, so we’re not going to be using a food diary in the same sense, but you could put together a food diary to help you plan out meals, write down any family or new recipes you come across in the blank notebooks, keep track of your diet or perhaps even any physical reactions you notice in your body after eating certain foods. This is particularly good if you have any digestive issues and need to eliminate what is causing you problems. I’ve done this before and it does work well to figure out what’s going on inside. Something else I’ve down before is keep a thought journal. When my mental health was particularly bad in September 2016, I began to keep a thought journal. Every evening I would write down any worrying thoughts I had from the day and then I would try to write a more balanced thought out underneath that particular thought that reframed the worry but also gave some acceptance and kindness to the troubled feelings underneath that worry. It is so therapeutic writing down your thoughts even writing down the good ones. It really does help you to make sense of how you’re feeling and a good way to practice getting to know yourself a bit better. If you’re a regular traveller or enjoy documenting your travels, then a travel journal may be the one for you. A travel journal gives you the chance to document your travels in the same kind of way a scrapbook does. You could include photos from your trip, postcards, tickets, day to day diary entries, thought clouds, souvenirs and more! This is such a lovely way to reminisce over memories and adventures you’ve been on as you go on your travels, after or even years to come when you look back on things and a great way to fill your blank notebooks. I never could quite get into bullet journalling because I would focus so much on making it pretty that I would end up neglecting the important things and therefore lose all motivation for it. If you can make bullet journalling work for you, then they’re a great way to customise your own system for keeping organised and on top of things. I love how flexible they can be and how you have complete rain over what kind of things you wish to put inside your blank notebooks. Pinterest has so many good examples and tips. I’d definitely recommend checking on there. I also love Hannah’s posts on bullet journalling and this one from Erin is so inspirational if you want an insight into a bullet journal that has been put into good use. I’ve always loved the idea of a dream diary. I’m really fascinated by dreams and whenever I have one that brings up a lot of curiosity for me, then I like to have a quick google to see what it means and see if I can see anything that may be resembling some underlying feelings. Writing down your dreams can bring you a better understanding of your dreams, noticing any patterns with your dreams and in the long term gives you a greater idea of yourself too. Plus we sometimes forget dreams so quickly that it might be cool to look back on your dreams a couple of years after they’ve happened and remember what you dreamt up when you were sleeping. Similar to a travel journal, but more focused on any events, memorable moments or any valuable memories in your life to make a memory book. You could include photos, memorabilia, any thoughts or feelings from that particular event, and so forth. I think this is such a lovely idea and something I’ve always wanted to do but have never got round to doing it. I love the idea of having something to look back on for years to come. You could do one for your relationship, your wedding, the birth of your children up until a particular age, a family book throughout the years. There are so many good ideas you could do to fill all your blank notebooks with amazing memories. To help with any spending or money saving issues, having a spending or savings tracker can be so useful in helping you to keep on top of everything. It’s also a good way to see where exactly you’re spending and how you can try to save more. This can also help you to learn to budget more often especially if you have any big projects you want to work on or something important you need to save up for. I know I need to get round to doing one! If you’re wanting to bring more adventure or to just simply do more, then a bucket list is the perfect way to get yourself thinking about what you want to do and putting it into a list form, so you have a clear vision and can tick off each idea as you go through it. There are so many different ideas you could include on your bucket list but it is essential you make it your own and do things that you actually want to rather than what you think you should or what someone else is telling you to do. How do you fill your blank notebooks? These are actually some brilliant ideas! These are such amazing ideas! I have so many notebooks and intentions to fill them, but I also end up stopping a week in! i am loving your blog posts! just stunning ! Love these ideas! Another one – I’ve recently started doing morning pages in my new notebook which has been quite nice and interesting. These are some great ideas, I keep meaning to write a food diary as I have some bad symptoms sometimes which could definitely help me!